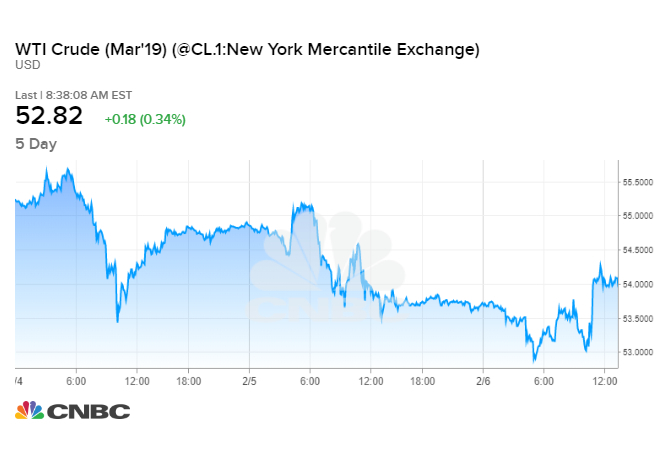 Benchmark oil prices were choppy on Friday, but remained on track for a weekly loss, pulled down by worries about a global economic slowdown. U.S. West Texas Intermediate crude futures stood at $52.76 per barrel, up 12 cents and looking at roughly 4.5 percent weekly slump, their steepest this year. International Brent crude futures had erased earlier losses around 2:20 p.m. ET, gaining 51 cents to $62.14 per barrel. On the week, they are set for a loss of about 1 percent. Picture: Spencer Platt | Getty ImagesOil pumpjacks in the Permian Basin oil field are getting to work as crude oil prices gain.